In June 1991, President Howard L. Biddulph of the Austria Vienna East Mission of the Church visited Kiev with his wife, Colleen. During that month, Ukraine's first official congregation of some 40 members was organized. At that time, ten missionaries served in the country under the direction of the Finland Helsinki Mission. 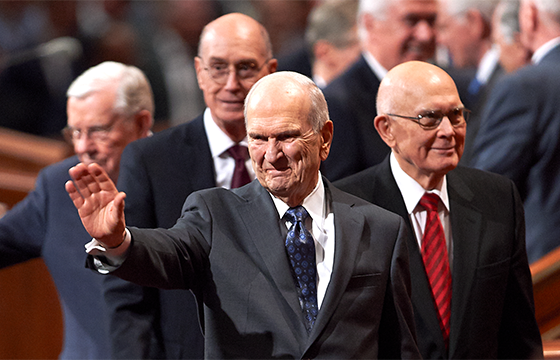 In September 1991, Elders Boyd K. Packer and Dallin H. Oaks of the Quorum of the Twelve Apostles (the highest governing body of the Church) visited Ukraine's members. Five months later, missionary headquarters for the country were created in Kiev with President Biddulph presiding. The 35 missionaries of the mission served a country of nearly 52 million people. In July 1993, an additional mission was organized in Ukraine, headquartered in Donetsk. Humanitarian assistance to members in Kiev was offered by members in Germany and the United States, who shipped thousands of pounds of food and clothing to members and nonmembers in 1991, 1992, and 1993. In 1995, the Church shipped six tons of medical supplies to aid the Kiev Institute of Cardiovascular Surgery. Many Ukrainian congregations have held worship services in rented halls and baptisms at indoor swimming pools or in the Dnieper River. Several Ukrainian members have taken group trips by train to the nearest temple, located in Freiberg, Germany, where special family-centered ceremonies are held. September 2001 brought the dedication of the first two meetinghouses built by the Church in the Ukraine Kiev Mission. The meetinghouses were built by renovating existing buildings. In July of 1998, a historical announcement was made that a temple would be built in Ukraine, marking the first temple in eastern Europe.